Ascended Master Djehuty (a.k.a. Hermes, Thoth, St. Germain, and Merlin) offers his perspective on why we seek the relationships we do, how we can learn to understand the purpose of relationships, and why many of us are not right now finding the relationships we assert that we want – and why this is in our highest good. 3 mp3s total 147 minutes. 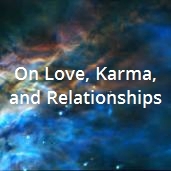 The post Djehuty on Love, Karma, and Relationships appeared first on tdjacobs.